Masaharu Ono has designed decorative Flower Nail that has a cute flower-shaped head. 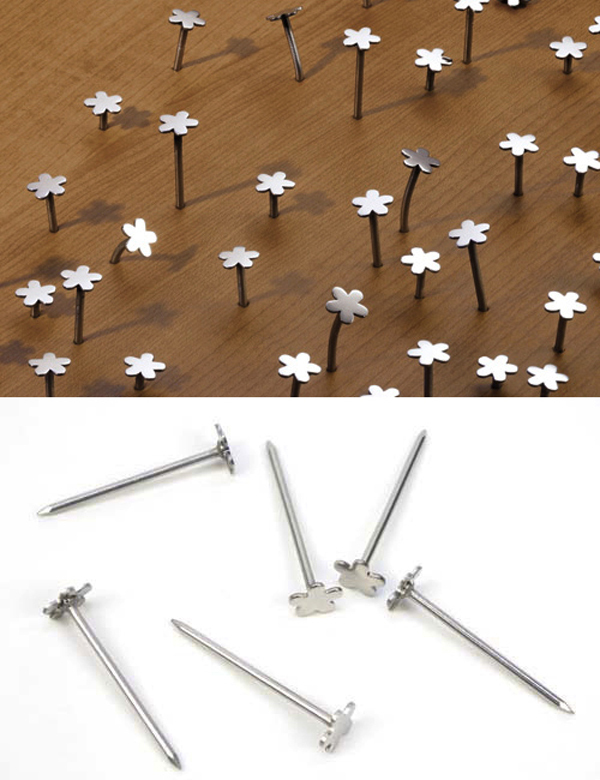 Available at packs of six the Flower Nail reinvents a function of a simple nail which is mainly practical. Now nails can be shamelessly displayed when something needs to be fixed. Nail hooks are quite common in decor but not for their aesthetics. There were quite a few ways conceived for hiding and disguising the cold and practical nail. Artworks, mirrors and other wall decorations have a thread or hook at the back rather than at the top. But still there can be things that should be fixed with regular nails. Masaharu Ono’s Flower Nail doesn’t need to be hidden as it is decorative and pretty as, well, a flower.